Woodworking Machinery -Jainn Jong Machinery Industrial Co., Ltd.
*Pneumatic auto lumber feeding device. *Tilting universal cutting spindle device. *Reinforced outer upper cutting soindle. *Frequency inverter for feed 6-60 m/min. * The table surface is made up of high ductile cast iron. The cutterhead guard plate is made of HSS steel and vacuum heat treated, hard chrome plated and precision ground for smooth wear resistance. * Elevation, cutter adjustment, lubrication and maintenance are all conveniently processed at the front of the machine, saving time and labor. * The feeding sizing adjustment of cutters is done through a numerical display control, allowing for convenient and rapid setting. * The machine is equipped with overload protection device for cutters. If an overload occurs, the feeding motor and all cutters will stop within 3 seconds, providing safety to the operator and extending the service life of the machine. * The Feeding roller utilizes pneumatic feeding and is coupled with gearbox for synchronous, powerful feeding effect. * The feeding can be operated in jog mode, for accurate and precise test runs. * The table surface adopts newly designed pneumatic lubrication for feeding, for easy feeding of all types of lumber. * The rear lower spindle can be installed with a gang rip saw, flat knife or forming cutter, according to processing needs. *The right spindle is equipped with an auxiliary feed roller which can be lifted through air cylinder, providing convenient tool changing or setting. 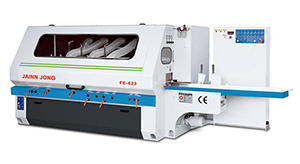 *Provides automated, fast end safety cutting operations. *The spindle is available to equip with an outside support for upgrading stability while cutting. *The cutterhead guard plate is manufactured from high speed steel, vacuum heat treated. The entire table surface is hard chrome plated for maximum wear resistance. *The table surface has a pneumatically activated forced lubrication device. This permits feeding with ease even for wet material. *The feeding mechanism consists of multiple air loaded feed rollers combined with lower rollers transmitted by universal joint shafts. The upper and lower rollers are driven synchronously to assure superior feeding effect. *The front and rear pressure plates on the upper cutterhead and the front pressure plate are retractable to ensure stability and safety when cutting material of excessive height. *The last spindle can be equipped with a universal spindle allowing complicated profile machining. The universal spindle may be tilted. It also provides functions such as top, bottom and vertical spindles. 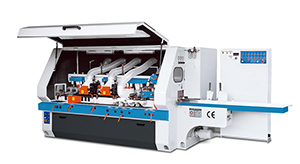 *The machine can be equipped with top, bottom, right and left router spindle. They permit direct slot milling in a single pass after moulding. * Note: The manufacturer reserves the right to modify the design, specifications, mechanisms, etc. without prior notice.